It all started with the photograph, above. It arrived in my email, sent by Mary Reilly, Chef-owner of Enzo Restaurant in Newburyport, Massachusetts. Romanesco steaks over a sauté of romanesco, confit garlic cloves, sun dried tomatoes, parsley pesto, brown butter almonds. 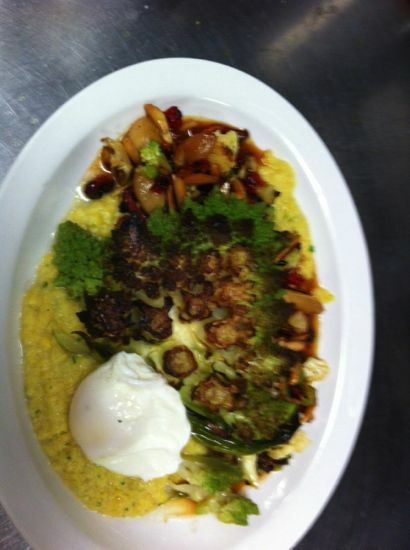 Over polenta made with stone ground flint corn and corn kernels, topped with poached egg and Parmigiano. Golden raisins are nice too. And butternut squash. And here’s what’s crazy. I looked at the photo, reviewed the reply and realized I had everything for this meal except the cauliflower. I headed to the grocery store where my hopes of a fancy green pointy romanesco cauliflower or orangish cheese cauliflower were dashed. There were only white cauliflowers, not too big, not too small, just average. I would not be deterred. This is less recipe than vague instruction. I did not measure, I just used experience and my best judgement. While it looks complex, the whole thing took only 40 minutes, start to finish. 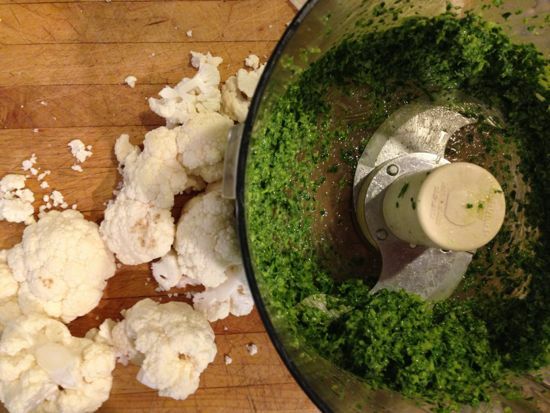 First, make the parsley pesto, whirring a good sized bunch of parsley with olive oil, salt and a few big pinches of grated Parmigiano Reggiano. It needed a little zip, so I grabbed the rasp and a lemon for some lemon zest. In a small saucepan, add a knob of good butter. Cook slowly until the foam disperses and the butter browns. Add in a cup or so of chopped, sliced or slivered almonds. Whatever you have. Toast them until they smell and taste incredible. Don’t let them burn. Sprinkle with salt. Set aside. Make polenta. Hm. I only had grits, so there you go. It’s corn, right? I had a little bit of two types, lovely yellow grits (a gift from Perre Coleman Magness, The Runaway Spoon) and white grits from Hoppin’ John. I cooked the grits just like a standard polenta recipe using a rich chicken stock from my pantry. When it was nearly cooked, I stirred in whole corn kernels (also from the pantry). I finished it with 1/4 cup of heavy cream, for a smoother texture. Prepare the cauliflower. Cut thick 1-inch steaks from the center. 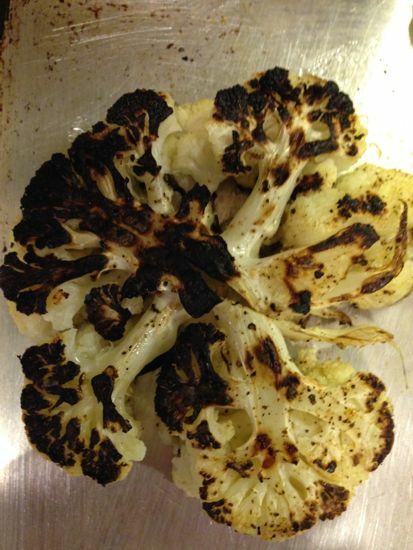 (From one medium cauliflower, I was able to take away three steaks — enough for the two of us, with a little leftover for lunch tomorrow.) Chop the remaining cauliflower into pieces the size of a fava bean. 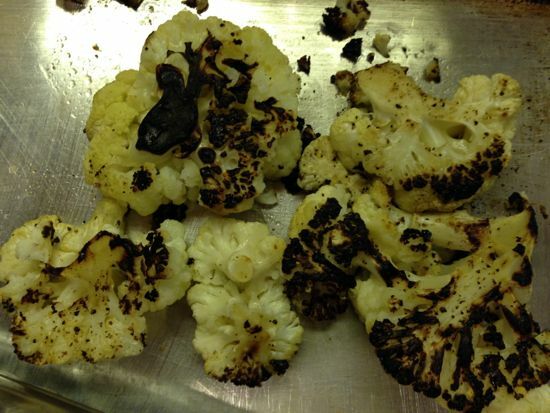 In a large heavy cast iron pan splashed with a bit of olive oil (or use a grill pan, or roast at 425°F), cook the cauliflower steaks until crispy, deeply bronzed and slightly caramelized on each side. (Oh, sigh. This is when the “steaks” fell apart. 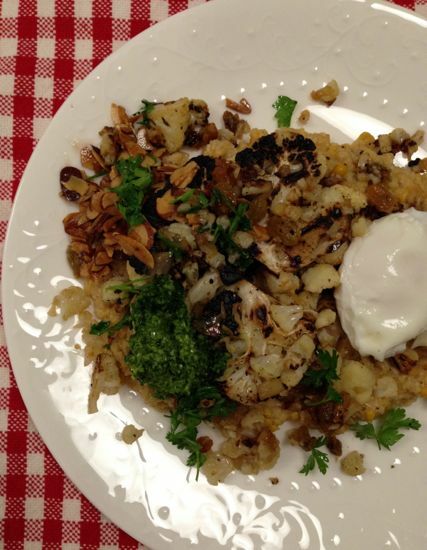 I still had nice crispy pieces of cauliflower for the plate. Thank goodness I don’t work in a restaurant.) Salt and pepper well. Remove the steaks and hold aside. Add some olive oil to a big saute pan and slowly saute a smashed clove of garlic until the oil is infused with the scent, but the garlic has not browned. Discard the garlic. 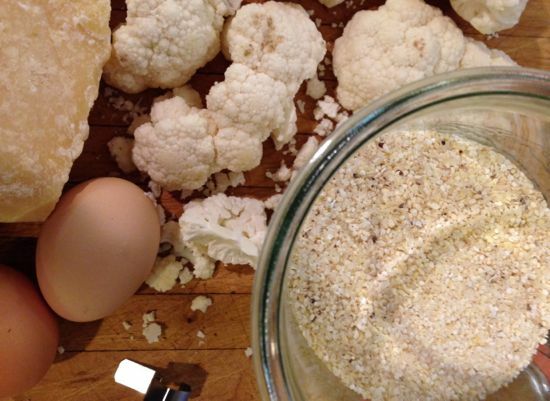 Turn the heat to medium high and add the smaller pieces of cauliflower. Cook until bronzed, then add a handful of golden raisins and four sun-dried tomatoes, slivered. Cook until heated through. Salt and pepper well. Poach two eggs. I love this tutorial from Food52, if you have never poached an egg successfully. OK, let’s plate this baby. Add a big generous spoonful of polenta to the plate. Set a cauliflower steak on the polenta, then spoon the cauliflower, raisin, tomato mixture over the top. Add a generous spoonful of pesto and a tangle of buttery almonds. Then slide that poached egg on the polenta, ready to drizzle yolky goodness into that corny deliciousness. With a vegetable peeler, shave some Parmegiano over the top (which I did after this photo was taken). It was glorious, Mary. I’m hoping I did your recipe justice. Mary and I met through Food52 and then met in real life. We instantly got on, talking preserving and cooking. We exchanged little packages of tasty foods – she sent me honey and caramels that took my breath away. Then, Enzo’s, her long time dream, opened. It’s a lovely space and the menu is sensational, changing with the market, the seasons. I had a remarkable dinner there back in the summer. It really was extraordinary and I urge you to go there right now. Yes, I know, Newburyport isn’t around the corner, and that makes me sad, too. But here’s the good news. If you follow Chef Mary Reilly’s twitter feed, or like the restaurant’s facebook page, you , too, are sure to find some inspiration. 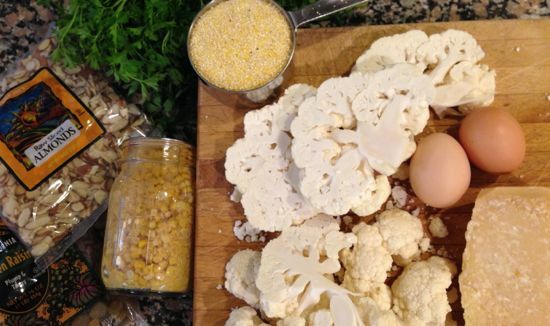 I have cauliflower coming in my CSA this week! Lovely, Cathy! Can’t wait to try this gorgeous dish.